The necklace is beautiful! The detail and vivid color are fantastic and realistic! Though a bit larger than I had expected, it's better to be able to see the detail! Thank you for this beautiful creation! I love my Miraculous medal. The Miraculous Medal is not only beautiful, it is very comforting. I have the Medal as a tattoo on my arm; I have always revered the prayer. Your new modeling of the Miraculous Medal is stunning. Thank you. I love the neclace - the chain is pretty and it is long, which I like. The medal is so pretty; however, it is not a true miraculus medal in that there is supposed to be engravings on the back of the neclace of a cross, hearts, etc. If you research the medal, you will see what I mean. So I don't know if I should have this blessed because it is not the replica of the medal our Mother Mary wanted us to wear. If you are only in for the look of the medal and not the spiritual benefits, then go for it! Either way, it is pretty and worth the money. 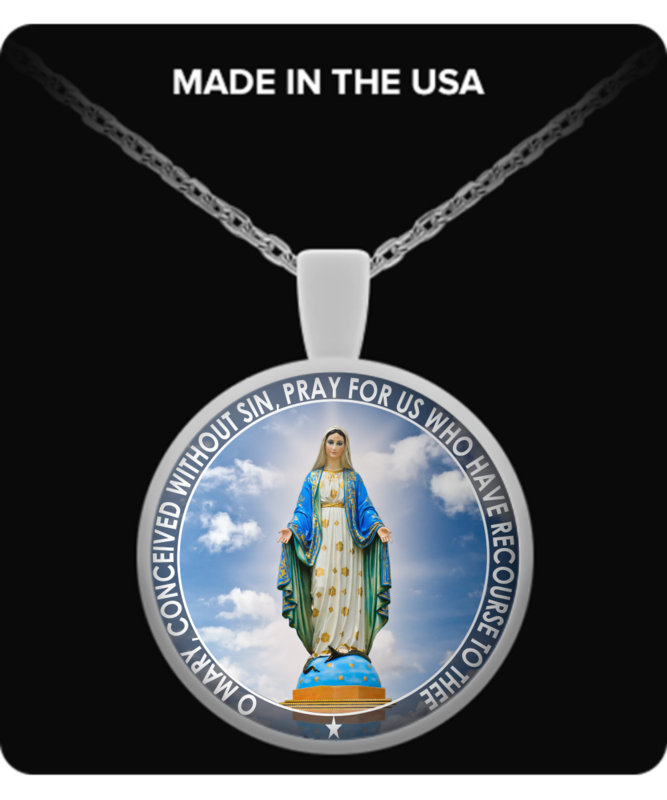 I really love the miraculous medal and am a promoter for prayers! Your necklace was beautiful and a pleasure to wear. My medal., even though silver, gets very dark. It came in a timely manner and I am overall very pleased. God bless!